In the game, players take on the role of groups of survivors, roaming around the Georgia countryside (which can be dangerous enough, even without zombies, lemme tell you). The characters you play are characters from the comic book series. So you can be in control of Rick, Shane, Machonne, and others such like that. Survivors will have stat cards that tell you what sort of special abilities the character has. The game will be played on (and come with) a special game mat which will have such elements as barricades, abandoned cars, and other terrain items. The game is not a grid system, though, as characters have a certain distance they can move. Though players are all playing as survivors, it's not a cooperative game. Resources are scarce and everyone knows it. It's a race to get the supplies you'll need to outlive this horrible situation. 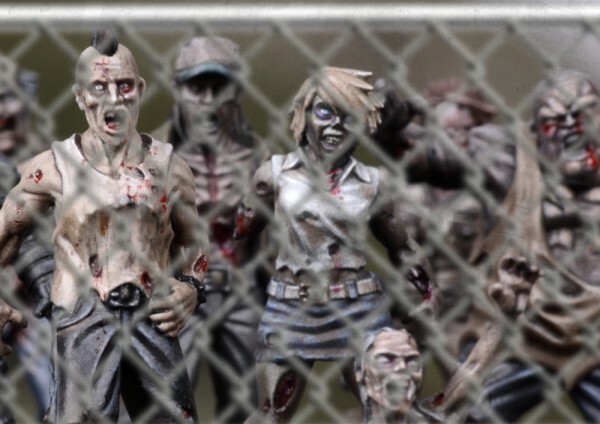 The Walkers are controlled by an AI set of rules specifically designed for the game. Expect more details as the release date draws ever-closer.